Do you remember the Glasgow Transport Museum? It sat round the back of the Kelvin Hall, a wonderland of old cars, a big fire engine, and best of all, the huge ship models in great glass cases. A Glasgow schoolboy could spend hours in there - and then it closed. The museum recently reopened in a new permanent home on the banks of the Clyde, a few hundred yards downstream of the SECC on former industrial land. Like the rest of the new developments on the Clyde it is a windswept, forlorn site, especially on a dreich winter day. When will this winter weather end? It will be British Summer Time in less than a fortnight! The transport museum (now called, for some reason, the Riverside Museum) is an ideal trip in such weather. Outside, the museum has a fashionably weird shape, designed by Zaha Hadid. Inside, it works well. What are your favourites? I personally really like the replica of Percy Pilcher's Hawk, as pioneer aviator Percy Pilcher is one of my heroes. Next to the Hawk is the world's oldest bicycle. Cool. There's a cafe, events for children, and a last-of-the-era sailing vessel on the Clyde outside. Like all Glasgow museums the Transport Museum is free, paid for by the municipality. So next time you're at a loose end and want to get out the house, why not revisit childhood? A recent walk along the River Esk revealed extensive landslips. For a coupe of hundred metres, just downstream from the prehistoric prominence of Maiden Castle, the steep left bank of the North Esk has slid into the river. I expect these happened when November's heavy rains caused a similar set of landslips at Mavisbank, one of my favourite local walks along the River Esk. Mavisbank was featured on the BBC TV programme Restoration, and my first visit was to see this derelict but architecturally notable ruin. 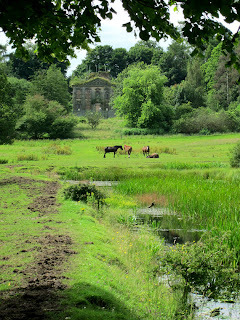 However subsequent visits revealed Mavisbank's true glory - its overgrown, semi-wild parkland and pond, with ducks, coots, heron, with fox, rabbit, deer, badger, horses and the occasional dog walker in the grounds, kingfishers, wagtails and wild garlic along the river, and elderflowers, brambles and holly berries in season. Now when we visit, the house barely merits a second glance. Accessing Mavisbank is difficult as the paths leading to it are muddy and have no parking on the minor roads on the estate boundary. It currently works well as a green lung for in-the-know locals, with those who care for Mavisbank doing so on an ad hoc basis, cutting back branches and digging ditches in an unco-ordinated but benign anarchy. The Mavisbank charity linked to above seems mainly concerned with the house and not the true glory of the place, the wildlife-heavy estate. Plans are afood however to improve access to Mavisbank. Although this will involve restoring the house, I suspect it will be the end of Mavisbank as a special place for wildlife and people, and the estate will be marred by litter, vandalism, dog mess and crowds. I hope not, but time will tell. 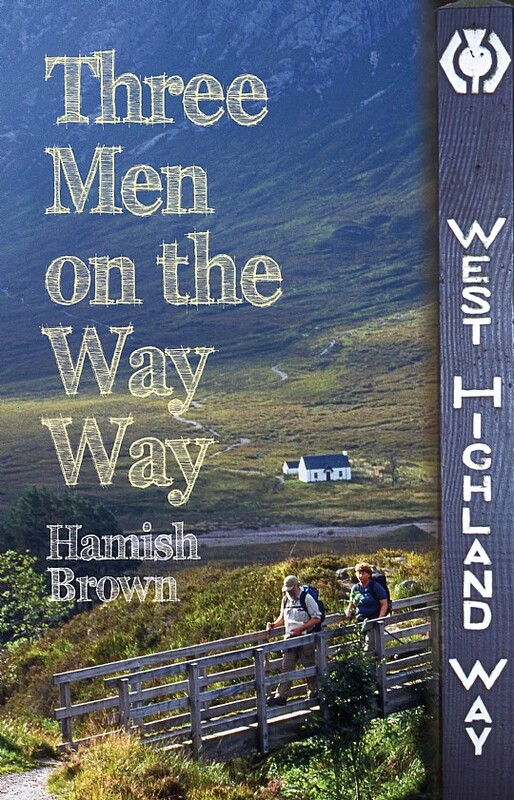 To cheer myself up, tomorrow at 18:30 I will be attending Hamish Brown's illustrated talk on the West Highland Way in Edinburgh's Blackwell's Bookshop. Like all such events this includes a modest amount of free booze (a penniless lush could, even in these days of austerity, water themselves well on book launches, art exhibitions, university debates and other such events), and as I got a book token for my birthday, guess where it is going! With the death of Tom Weir, Hamish is now the granddaddy of Scottish hillwalking, so it should be a good evening. Maybe I will see you there! What do you give for his birthday the man who loves water, planes, and Scotland? A seaplane flight from Loch Lomond, of course! On my 'bucket list' before turning 40 are a number of items, like running a marathon and traversing the Cuillin of Skye in a single trip. I also wrote 'seaplane' and somebody must have seen it. It referred to changing my job to being a seaplane pilot - an impractical dream, but then aren't all dreams before becoming reality? The seaplane is owned by Loch Lomond Seaplanes and if you have the money, I cannot recommend the tour enough. "Are you by yourself?" asked the pilot as he put everyone on the plane on a dull early spring Saturday. "Then I'll put you in the co-pilot seat." Best view in the house! We took off from Loch Lomond, banked over Helensburgh, and were over the Clyde in no time. Below us, a hunter killer submarine in the Clyde - probably the newly commissioned HMS Attack. There was plenty military activity in the area today, including one of the navy's recently decommissioned aircraft carriers slumbering at the long-term anchorage in Loch Striven. "Shall we land on deck?" joked the pilot. Out over Argyll it was still misty, Mull only just visible, the Corrievreckan stirring faintly, other tide races to the north of Jura. I remembered the last time I was here on the Island Peaks Race, on the water, watching a display of porpoises. No porpoises visible today. The weather remained dull until we reached Loch Awe. I'd been enjoying the sights, the changing colours of the rocky shorelines, sand underneath water, forestry plantations felled by wind, snow in hollows, the occasional wind farm. But at Loch Awe the clouds cleared to reveal dazzling, white-capped hills, and the flight took on an element of the magical. What sights there were to see! All too soon we were over Loch Lomond, the sun out, the water sparkling, the flight nearly over. And then - the approach and landing over the smooth enticing expanse of Loch Lomond. It was the best aeroplane landing I'd ever experienced, probably due to the calm water. I'm not sure where I first saw Fast Castle - probably a reproduction of a 19th century romantic era painting in a discussion of Walter Scott's The Bride of Lammermuir, and the dramatic situation and likely stirring history of this guardian of the Forth piqued my interest. It was to be a while before I visited though. A walk from Dunbar to Tynemouth several years ago took me past a sign to Fast Castle, but I was aiming for Eyemouth for teatime and didn't want the detour. Recently, I returned. The castle is smaller than expected, though it extends down a sharp headland for further than first appears. Its situation is quite giddy, a southern Dunottar, a northern Tintagel, but unlike these famous citadels it is dominated to landward by beetling cliffs, and has no beach at its base, nothing but inacessible rocks between it, the sea, and the cliff faces on either side. The ruins are vestigial, the occasional rotten corner still a couple of stories high. I noticed that there is a rock stack to the south towards St Abbs Head. 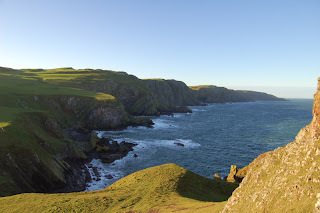 I had always been under the misapprehension when on St Abbs Head that this distant rock stack was Fast Castle. Finally, the headland runs out of space with a view up and down the jagged Berwickshire coastline, a lone tanker on the horizon. No 16th century English privateers today. The use and history of Fast Castle is puzzling. Its situation on the entrance to the Forth should have made it a base for repelling English privateers, yet it seems too small for a royal castle. Even as a private, pirate base it seems to be an improbable ediface, as there is no haven for boats on the headland itself, or in the steep, rocky bays on either side. Even an Orcadian would baulk at landing here (though apparently there was a pulley to haul up people and goods, like some Greek mountain monastery). It is overshadowed by north-facing cliffs, and so in a weak position if attacked from the land. Yet despite these hardships, the history of Fast Castle shows that not only Queen Mary on the run from her Protestant nobles stayed here, but also the teenage Margaret Tudor on her way to marry James IV. For me though, the highlight was not the mystery of how the castle was approached from the sea, but the movements in both the rocky bays far below. Careful observation revealed the cause - cream and mottled brown baby seals hauled up on the rocks, with the parents larger and grayer in the water offshore! A fine short walk for a blustery, dark day, ice on the roads, and home to a crackling fire.